Japanese food as we know it would be very different if it didn’t include noodles. From Japanese udon noodles to buckwheat noodles to Japanese ramen and other forms of Japanese noodle soup, there are so many Japanese recipes containing noodles out there that it is impossible to get bored. With Japanese noodle dishes becoming more and more popular as time goes on, the desire to discover more about this traditional Japanese food has only increased. Learn about the different types of Japanese noodles, browse Japanese noodle recipes, find the perfect Japanese noodle bowls, and more, by continuing to read below. Udon are white and thick Japanese noodles made from wheat flour. 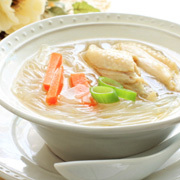 They have a delightfully chewy texture and are most commonly used in traditional hot Japanese noodle soup recipes, where the udon is served in a savoury dashi soup broth with several savoury garnishes on top. Some udon dishes have special names depending on their savoury garnishes, including kitsune udon (with a piece of aburaage fried tofu), chikara udon (with one or two grilled mochi rice cakes), and tanuki udon (with pieces of fried tempura batter). Udon noodles can be bought in two forms; dried or pre-cooked. Dried udon come in long, thin packages like dried spaghetti. These udon are great for boiling or simmering dishes like udon soups, oden, or nabe hot pots. Pre-cooked udon come in single serve, vacuum-sealed bags, and only take a few minutes to prepare. These udon are ideal for stir fries or barbecued noodle dishes. Originally from China, these long, yellow, egg noodles are the main ingredient in ramen; a dish so popular in Japan that there are museums dedicated to it. Japanese ramen noodle soup consists of a huge bowl filled with a broth (which is typically seasoned with salt, soy sauce, ramen, and/or tonkotsu pork bone stock) and ramen noodles, then topped with assorted meat, protein, and vegetable garnishes. There is a staggering variety of pre-packaged ramen noodles in existence. Most of these are instant ramen, meaning that all you need to do to prepare them is add hot water. Which Flavour is Your Favorite? Popular ramen flavours include Japanese chicken noodle soup ramen (torigara), pork bone stock ramen (tonkotsu), miso ramen, and soy sauce ramen (shoyu). Despite their name, which means ‘cooked buckwheat’, yakisoba noodles do not contain any buckwheat. Instead, these noodles are made from wheat flour, vegetable oil, and a little salt. The name ‘yakisoba’ actually refers to the barbecued Japanese noodles recipe for which this type of noodle is most commonly used. Yakisoba noodles come in pre-cooked, vacuum-sealed packs, with sachets of yakisoba sauce included for making fresh yakisoba at home. There are also instant versions of yakisoba. Most of these come in square-shaped bowls. All you need to prepare these yakisoba is hot water and a couple of minutes. Soba, or buckwheat noodles, are noodles made entirely or partially from buckwheat flour. In fact, ‘soba’ is the Japanese word for ‘buckwheat’. Japanese soba noodles have a slightly rougher, earthier flavour than other noodles, and they will often be flavoured with seasonings such as matcha green tea, shiso perilla leaf, or yuzu citrus. Soba noodles are often enjoyed in noodle salads and other cold Japanese noodle dishes. Soba is also enjoyed in hot noodle soups, the most notorious of which being toshikoshi soba; a New Year’s soup served for dinner on December 31st every year. 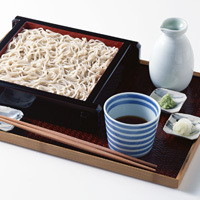 Soba is commonly served cold on a special grated tray made from bamboo or similar, with a side of tsuyu (or mentsuyu) dipping sauce and assorted garnishes. Have no Appetite in Summer? Somen noodles are very thin wheat noodles that are almost always served cold with tsuyu dipping sauce and garnishes like chopped spring onions. 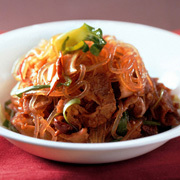 Shirataki noodles are made from yam flour and come in sealed packs surrounded by water. They contain virtually no calories and are often used to bulk up or add texture to stews and hot pots. Harusame are clear, thin noodles (also referred to as ‘glass noodles’ or ‘cellophane noodles’), made of mung bean flour and used in stir fries or soups. 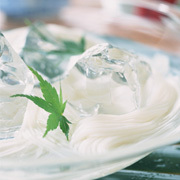 In Japan they are often eaten to fight fatigue, and they are said to be good for reducing swelling problems in the legs. Japanese rice noodles are simply any type of noodle made with rice flour instead of wheat flour. These are particularly ideal for people with gluten intolerance. 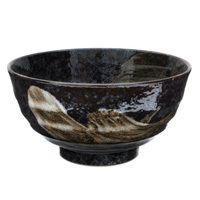 These bowls are perfect for serving hot noodle soup dishes, such as ramen or traditional Japanese noodle soups with udon or soba. 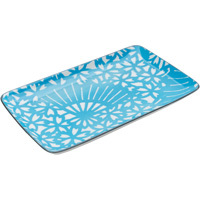 Long, flat plates like these are ideal for serving yakisoba and other barbecued or stir fried noodle dishes. These trays, traditionally made from bamboo, are designed for serving cold soba or udon noodles with sides of tsuyu dipping sauce and garnishes. 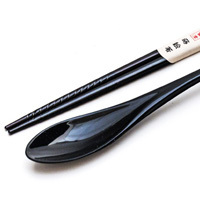 No bowl of ramen noodle soup should be tackled without a pair of non-slip chopsticks and a big ramen spoon. Founded in 1878 by Hikokichi Sumio and remaining under the ownership of the Sumio family, Kumamoto-based noodle makers Itsuki produce dried, pre-cooked, and instant Japanese noodle products for Japan and other countries around the world. They are innovators in noodle production and strive to always deliver delicious, authentic foods and flavours that will satisfy the ever-changing tastes and preferences of their customers. Founded in 1954, Sanyo is a Japanese food product manufacturer primarily recognised for their instant noodle brands, the most notorious of which being Sapporo Ichiban. "Sapporo Ichiban", translated from Japanese, means "Sapporo's Best" or "Sapporo's number one." Other popular Sanyo products include their Okonomi Yakisoba. Maruchan, established in 1962 under the watchful eye of Tokyo-based food manufacturer Toyo Suisan, is one of the most successful instant noodle brands in Japan and around the world. As well as selling popular instant noodle products like Akai Kitsune Udon Bowls and Midori no Tanuki Soba Bowls, Maruchan also make Attaka Gohan Microwavable Rice, one of japancentre.com’s best-selling food items.